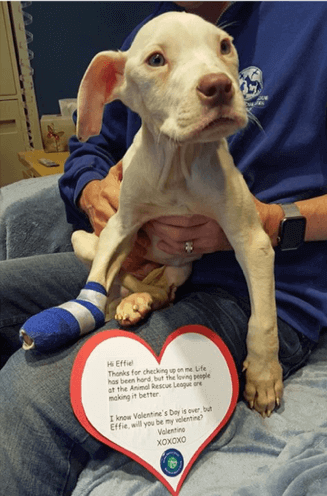 Valentino was found in a snow-covered cage at 8 weeks old, emaciated and abandoned in a field near Pittsburgh. The Bow Wow Buddies Foundation’s grant program helped him get back on his feet. Camp Bow Wow’s nonprofit arm, the Bow Wow Buddies Foundation, has launched a new mission that focuses on ailing dogs and getting them the medical attention they need. Seeing numerous heartbreaking posts and articles online about families pleading for assistance to cover medical bills for their beloved pets sparked the idea for the Foundation’s refreshed and refined mission. Since Camp Bow Wow was founded in the Denver area in 2000, it has always been a part of our mission to give back to the community. Over the years we’ve been involved in a number of charitable efforts to promote the health and well-being of our 4-legged best friends. The new initiative will allow us to focus our efforts on getting funds where they’re needed most, to ensure that dogs get the veterinary care they need to stay happy and healthy. Our dog-specific grant program provides up to $2,500 for emergency or necessary care to families, rescue groups and shelters. “An example might be when a dog needs a mass removed or has a broken leg — sometimes they actually need an amputation but can go on to live long, healthy lives. And then there are problems like heartworms, which are especially prevalent within shelters or rescues,” explains Erin. Camp Bow Wow franchise owners have always gotten involved in their individual communities, many of them fostering dogs and helping them find forever homes, partnering in adoption events and working with shelters and rescue groups to promote spaying and neutering to curb overpopulation. So far, their work has helped find homes for more than 25,000 animals. Some of the Bow Wow Buddies Foundation’s previous projects have included veterinary care grants, but this is the first time we will focus all our attention in that area. “All of our Camps do fundraisers throughout the year to raise money for canine causes, so our funding is really client-driven — which is what I would expect. We have over 130 Camps that are open, and so many people are willing to donate. Our clients are pretty generous. They love pets, so they love other people’s pets, too,” says Erin. 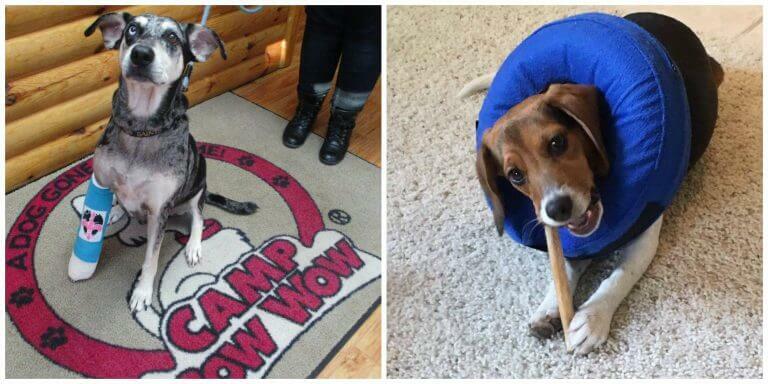 The Bow Wow Buddies Foundation helped Gypsy, left, get emergency treatment after she was hit by a car in New Orleans, and paid for life-saving heart surgery for Nora, right, whose Tempe, Arizona, family could not have afforded it otherwise. Since launching the new mission in October 2015, the goal was to provide about one grant per month. Instead, they’ve been averaging about one per week. To find out more about The Bow Wow Buddies Foundation, go to www.bowwowbuddies.com. To learn more about the opportunity to open your own Camp Bow Wow franchise, you can download our free franchise report to start a conversation. You can also explore our research pages for the answers to many questions you may have. We look forward to hearing from you!